Dori has a passion for helping her clients achieve optimal health by empowering them with nutrition education. She also enjoys assisting clients in learning how to have a healthy relationship with their food, body, and mind. She understands that there is no one “diet” or “quick fix” that works for everyone. That’s why she provides her clients with individualized one-on-one nutritional advice and steps to meet their unique health and dietary goals. 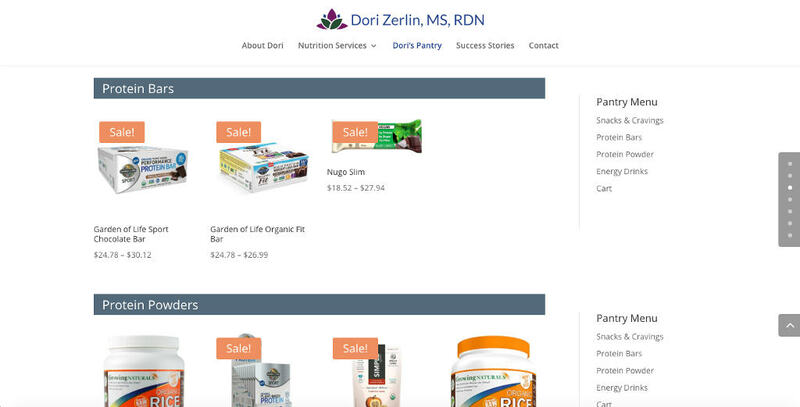 A custom template was created to reflect Dori Zerlin’s philosophy of nature-based, personalized nutrition. Strong visuals of vitamin-rich foods, a clean and cheerful design with plenty of white space were employed throughout. Clean, clear and stylish fonts were used for the logo. The colors and fonts present in the logo were then implemented strategically throughout the site for a crisp final product. Speed of Like implemented an easy-to-use Amazon Affiliate system into Dori Zerlin’s website for e-commerce functionality. Could a new, visually-rich, mobile-friendly website with the right messaging help your business grow? “I am so THANKFUL for Speed of Like! I was in dire need for a new website and had a one week deadline to finish it, however, Speed of Like came to my rescue. They replied to all my questions immediately and with incredible ease. I barely had to tell them what I needed because they somehow already knew what would work best with their artistic insight and clever intuition. Overall, Speed of Like are quick workers, detail oriented, creative, insightful and very affordable. They literally made my website into a masterpiece overnight! I would highly recommend them!